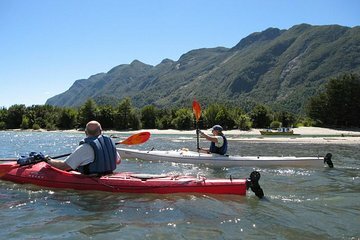 Paddle your way around Chile’s dramatic fjords on this full-day Patagonian kayaking adventure, including hotel pick-up from Puerto Varas. Cruise down the Petrohué River to the first Chilean fjord, enjoy striking views of the Osorno Volcano and spot colorful kingfishers along the waterfront. After tucking into lunch (included) on one of the fjord’s beaches, relax with a dip in the Ralún hot springs. With all equipment and full instruction provided, this tour is suitable for all skill levels, including first-timers. • Your centrally located Puerto Varas hotel.